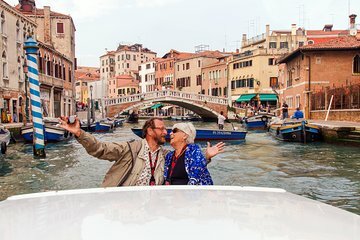 This is a good tour if you don't want to pay the 90 euro for a half hour gondola ride. Our guide was very knowledgeable about the history of Venice. Because we were on a larger boat, you don't see many of the very small canals. The best part of the tour was seeing Venice from the top of the bell tower at the Basilica of San Giorgio Maggiore. Boat was OK not a luxury, though, the guide was OK. It was in Venice, so the views were really great. Expected a little more than just climbing the tower of San Giorgio Maggiore a short island and basilica tour would be great. Definitely too expensive. Thoroughly enjoyed the trip. Tour guide was very knowledgeable and we got to see parts of Venice we would not have seen on our own. Excellent tour and guide! Definitely would recommend as a good value and worth the time. The guide was very good and very well informed.